I love the new King's Quest game from The Odd Gentlemen! A few days ago I finished the most recent installment, "Once Upon a Climb" (chapter 3), and it was lovely! King Graham revealed the one dish that he's adept at making, though at the time, he was trapped in a tower and unable to make it. and I didn't see any choco-chips." 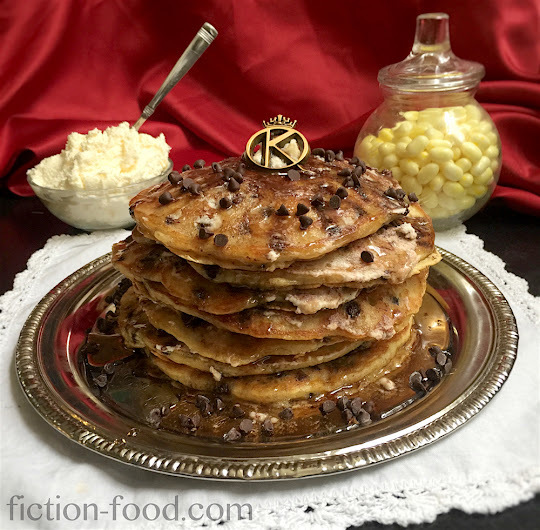 –King Graham, "King's Quest: Once Upon a Climb"
At the end of the game, the dear, elderly King Graham (voiced by Christopher Lloyd) makes his famous choco-chip pancakes for his sweetheart's birthday, same as he has done every year. It's such a touching scene (and they also gush about buttered popcorn flavored jelly beans ;) ). I'm so looking forward to chapter 4! 1. In a large bowl whisk together the dry ingredients (the 1st 5) & in another bowl whisk the wet ingredients (the next 3). 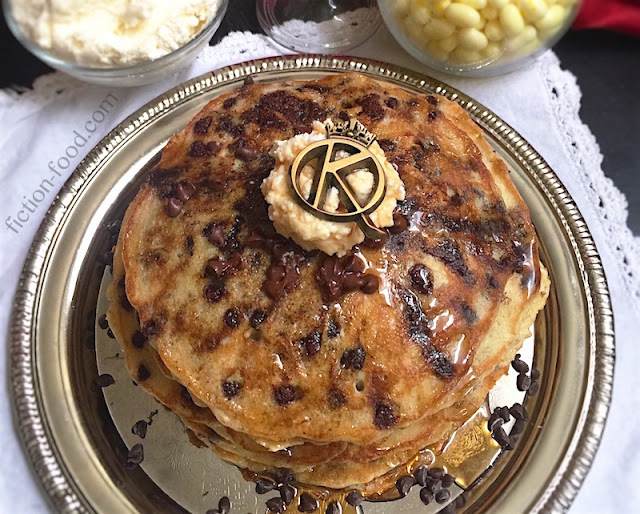 Pour the wet into the dry, add the chocolate chips, & stir only until you get a moist, lumpy batter (don't over-mix or your pancakes will be flat!). Let the batter sit while you preheat your skillet to 350ºF or large pan to medium. If you'll need to keep the finished pancakes warm before serving, preheat your oven to 175-180ºF & slide in a baking tray. *Serving Suggestion: Whip up some whipped cream or sweet butter by whisking 1 cup of heavy cream in a chilled metal mixing bowl with 2-3 Tbsp. of sifted powdered sugar. Whisk/mix until thick & smooth for whipped cream, or go a little longer until it's a bit stiffer. If you'd like to go all the way to butter, keep whisking until the solid fats separate from the liquid (buttermilk!) & the solid mixture is smooth. Drain (cheesecloth or flour sack cloth works great) & save the liquid to use for pancakes or other recipes! Oh man, these look awesome! I haven't played King's Quest before, but I've seen a lot of ads for the new installment. Is it bad that I want to play it because it looks so pretty? My kids will definitely love to try this recipe! Looks yummy and sweet, something that we can eat once in a while. buying college papers online is "in" at the moment and for those who wants to give it a try they can do so. 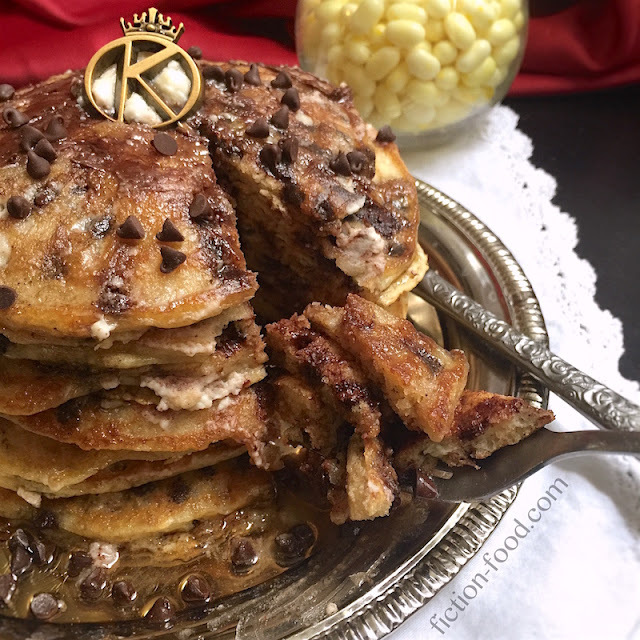 But this choco chip pancake recipe is totally a winner!